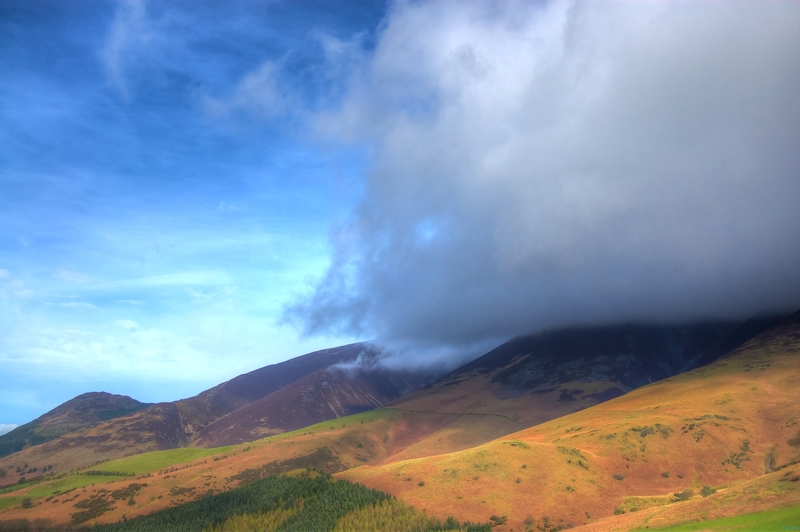 Just after an April storm in the Lake District, a huge bank of cloud rolls over the southern flank of Skiddaw, leaving the upper slopes quite literally under a dark cloud. If you didn’t venture into the cloud – it was a lovely day as you can see, but weather in the mountains is like that. The photo was taken on the popular path from Keswick to Latrigg. The small fell on the left is Dodd – I’d gotten a right soaking there the previous day. This sort of weather is an ideal subject for timelapse – something I intend to try the next time I’m up in the Lake District. Great picture! Last time I was on Skiddaw there was a thermal that was sending wisps of cloud straight up at about 30 mph, right next to us. I will never forget it. One of my favourite mountains though.